On August 18, NBC News anchor Brian Williams began his broadcast -- shown live to West Coast viewers, something done only for very significant occasions -- by excitedly declaring: "It's gone on longer than the Civil War, longer than World War II. And tonight, U.S. combat troops have pulled out of Iraq." He immediately called in Chief Foreign Correspondent Richard Engel, who was exclusively embedded with the 4th Stryker Brigade. 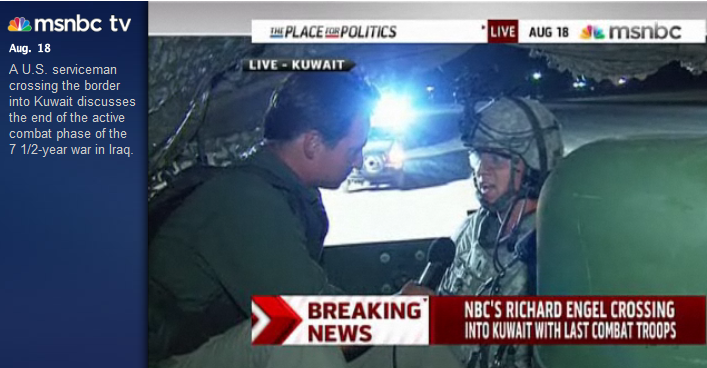 Engel excitedly announced that "the last American combat troops rolled" into Kuwait just moments ago. We were then treated to grainy video of the khaki-dressed Engel "rolling out" with the Brigade, interviews with American soldiers describing what a historic event this was, all while the "NBC NEWS EXCLUSIVE" logo was plastered on the screen -- quite reminiscent of the embedded media coverage that glorified the invasion itself. Even Williams noted the similarity: "We watched the invasion happen on live television thanks to, at the time, some brand new and exclusive technology. Well, tonight again we have watched the pullout of combat troops the same way." At the end of the 7-minute segment, Williams heaped praise on Engel, whom he hailed as "our own young veteran of this conflict," for this "astounding bit of reporting." Two thousand six hundred and sixty-six days since President Bush declared "mission accomplished" in Iraq. Two thousand seven hundred and eight days since American forces invaded Iraq. At this hour, American combat forces are leaving Iraq. OLBERMANN: This is a special edition of COUNTDOWN. Chief foreign correspondent, Richard Engel, in a world exclusive, embedded with, reporting live from the last convoy of American combat troops as it leaves Iraq via the Kuwait border. UNIDENTIFIED MALE: You're watching the end of an era of the American military. OLBERMANN: With Rachel Maddow inside the Green Zone in Baghdad, and Chris Matthews, Lawrence O‘Donnell, Eugene Robinson, Howard Fineman, Jim Miklaszewski at the Pentagon, retired General Paul Eaton, retired Colonel Jack Jacobs, Senator Ron Wyden of Oregon and former weapons inspector Charles Duelfer. From Baghdad, from the Iraq-Kuwait border, from Washington, from New York -- this is COUNTDOWN's special continuing live coverage of the end of America's Iraq combat mission. As Olbermann indicated, Maddow was in Baghdad's "Green Zone," and she explained: "it is really, really hot right now. But yet, seeing what we just saw, right here live with that gate closing, the last U.S. combat troop, I'm totally covered in goose bumps. It is an important moment." By offering it exclusively to both NBC and MSNBC, the Pentagon ensured that this narrative would be given the Seriousness imprimatur from NBC, and would produce base-pleasing, Obama-favorable praise from MSNBC personalities. Having Engel embedded in a Stryker vehicles as it "rolled out" of Iraq, and Maddow stationed in the Green Zone, added to the historic tone of the evening. As The New York Times' Brian Stelter reported: "David Verdi, an NBC News vice president, added, 'The military had said, 'You are the ones who are going to broadcast it first'." About that, Mediaite's Steve Kraukauer wrote: "That’s a stunning admission, and shows a degree of coziness between both sides here." With this cooperative venture, the White House got exactly the coverage it wanted: the repeatedly hyped claim that under Barack Obama, "American combat forces are leaving Iraq," as Olbermann intoned at the start. This is the great irony for me, Keith. The fact is that under the delusional plans that former Secretary of Defense Donald Rumsfeld had approved for the invasion of Iraq, they had intended to come down to 50,000 troops within three or four months of that invasion. . . . .That, for me, is the ultimate irony, is the fact that more than seven years later, we‘ve now gotten down to the 50,000 troops that they thought they could get down to within three months of the invasion. . . . . [T]hose 50,000 men and women include special forces who will be going out on counter-terrorism missions with Iraqi forces. That, to me, is combat. They're armed. They're going into combat. There will be American, quote/unquote, advisers going out with Iraqi forces on regular patrols. That to me opens the door to combat. So I don‘t think we‘re going to see the end of -- we are not going to see the end of combat for American forces I don‘t think in Iraq. To begin with, combat in Iraq is not over, and we should not uncritically repeat suggestions that it is, even if they come from senior officials. The situation on the ground in Iraq is no different today than it has been for some months. Iraqi security forces are still fighting Sunni and al-Qaida insurgents. . . . . The ability of the Pentagon to shape coverage through controlling access, offering embedding, and doling out exclusives is too well-known and well-documented by now to require much discussion. The problem, however, is that it remains irresistibly enticing for many media outlets to submit to it. The fact that NBC/MSNBC was the only television news outlet with video of the "last combat brigade rolling out of Iraq" was a major coup. The only way that coup matters -- the only way the journalists covering this event "exclusively" can feel as though they're doing something important -- is if they vest the event with historic significance, accomplished by touting it as "the end of America‘s Iraq combat mission," exactly the message the administration wanted disseminated. The fact that this phrase -- "the end of America‘s Iraq combat mission" -- is more propagandistic than anything gave no pause. The withdrawal of 100,000 troops from that country since Obama's inauguration is not insignificant, and it's a good thing that he's adhered to the withdrawal schedule. But, as Landay explained, 50,000 troops is a huge number -- it's what Rumsfeld originally envisioned as the occupying force to be used three months after the invasion -- and it's inevitable that they will be in combat. And that's to say nothing of the large number of private-militias which remain -- paid for by American citizens -- as well as the so-called "private army" which the State Department is currently assembling, to be deployed in that country. That's why AP refuses to use these misleading terms "even if they come from senior officials." That, and because they weren't the ones gifted with the "worldwide exclusive" coverage by the Obama administration and its Pentagon.